Thanks, I noticed one of my blogs basically stop and hung trying to load mybloglog so I found your post and this worked perfectly. You are a lifesaver-had 7 of my blogs that had this problem,my host company could not work it out,my blogs took ages to open and I was losing heaps of sales as people would not wait for page to open-can not thank you enough. Thanks for this! I added it before and forgot where it was. Thank you so much. I was on the brink of despair. After much hard work the site was on the first page of Google for “fiddle tune”….but it would not load. Now it is healed of the mybloglog curse. Thanks so much for this post! 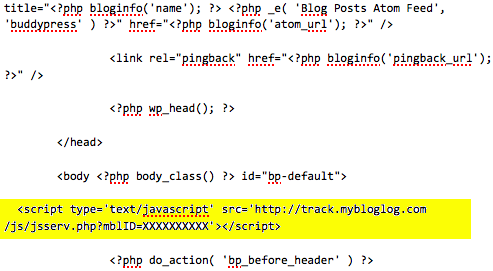 Our blog suddenly started hanging and I couldn’t work out how to get rid of the mybloglog code. Thank you so much for this info! I fixed the stupid slow load! Thanks for this article Paul, it helps me a lot. I’ve been looking for this kind of tips thanks again.